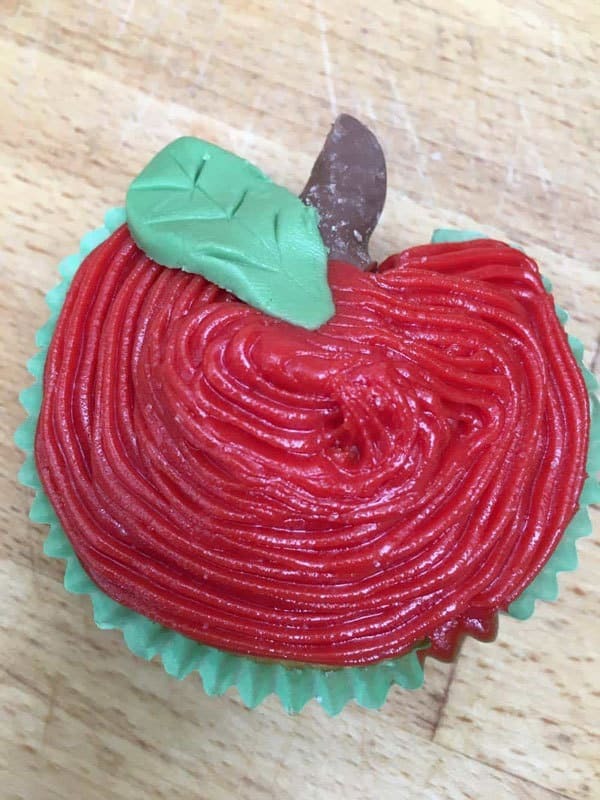 Whether it’s back to school treats for the kids, class treats for the kids birthdays, school cake sale, or end of school year party I like to make some cupcakes. 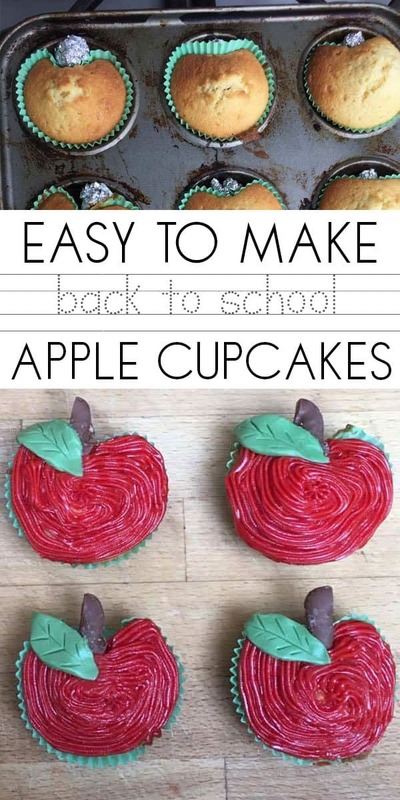 The simpler the better and these Easy Apple Cupcakes are perfect and really easy to make. You can knock them up in an evening once the kids have gone to bed. If you would like to jump straight to the recipe and miss out on our top tips you can either scroll down or click on the link below. If there is one recipe that I use over and over again it’s my simple cupcake recipe. It’s easy to remember and I know that without the kid’s help takes less than 10 minutes to mix and then 12 – 15 minutes to cook. Once cooled they are easy to decorate and perfect for adding frosting or fondant. We have included links to the ingredients and equipment we used to create this recipe. If you buy via these links we may earn a small commission. These cupcakes you can either decorate with a store bought frosting or make your own buttercream frosting which works fantastically to decorate them with. 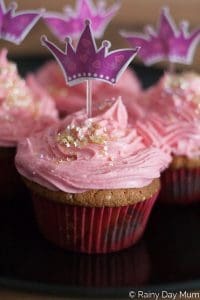 When making buttercream I often use the same recipe that I made our Pink Princess Cupcakes with it’s an easy vanilla buttercream frosting and tastes amazing. 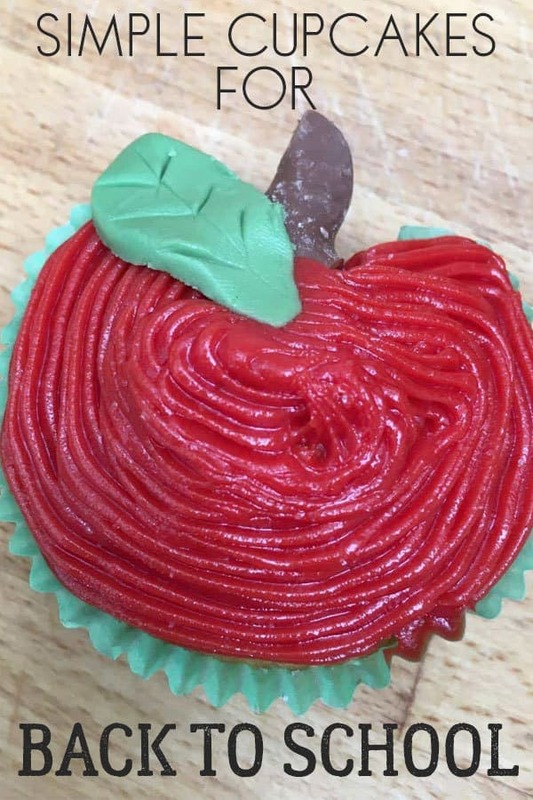 Ohhh and instead of pink food colouring this time use red or green for the apples. 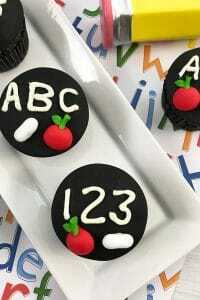 Scroll down beyond the recipe card to find the equipment that we used to create these school-themed cupcakes. 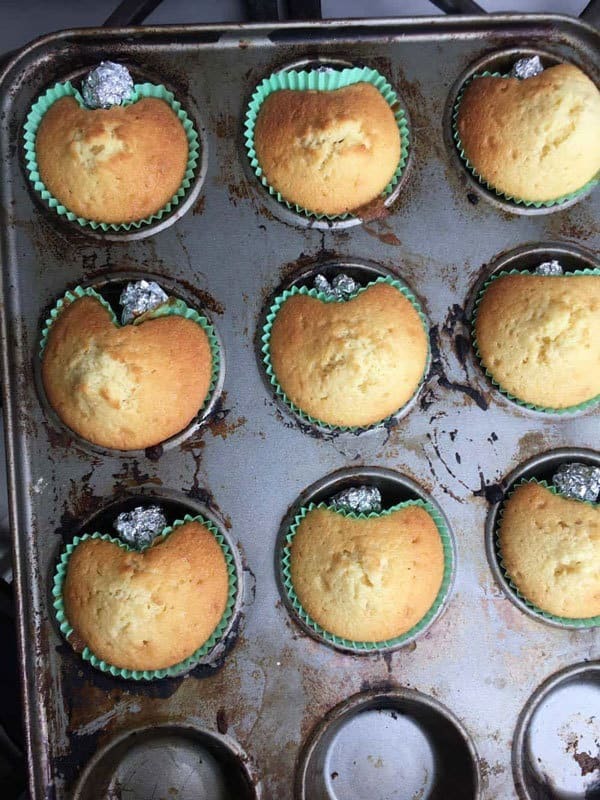 Mix up the cupcake batter as normal but before you spoon into your cupcake liners roll a small ball of foil and place at the top between the muffin tin and the liner so that it will form an apple shape. When adding the food colouring it is better to use a gel or paste – check out the link to the brand that we use in the ingredients list above. Add it to the buttercream with a toothpick and mix together until combined. You can use a palette knife to spread the frosting on the cupcakes but I find it easier to use a piping bag and tip. It makes it easier to control and fill in the cakes. 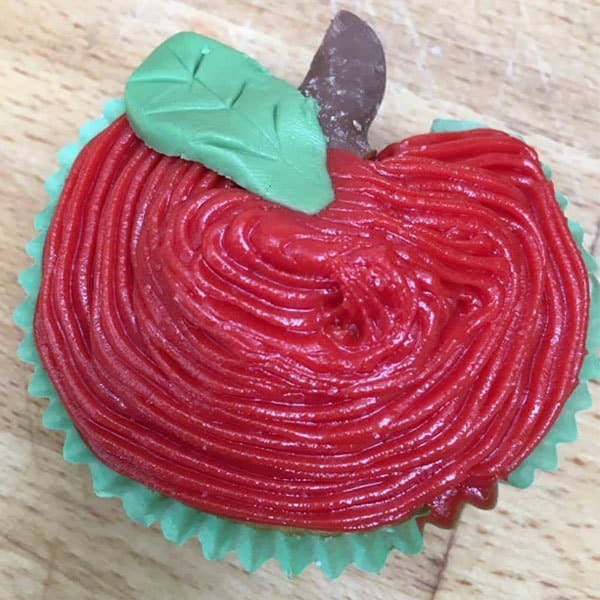 Easy to decorate Apple Cupcakes ideal for school treats, end of school parties or back to school for the kids. Mix up the cupcake batter as per the instructions. Before adding to the cupcake liners roll a small ball of foil and place between the liner and the muffin tin. Add the cupcake batter to the liners and cook for between 12 and 15 minutes. Whilst the cupcakes are cooling make up the Vanilla Buttercream frosting. Add in the red or green food colouring paste and mix well. 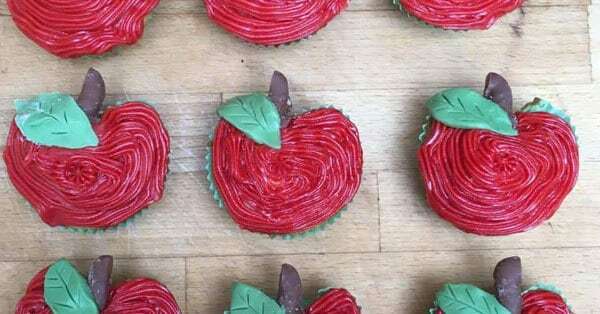 Roll out the green fondant and use the leaf cutter shape to cut a leaf for each of the apples. Cut the chocolate fingers into half these will be the stalks. 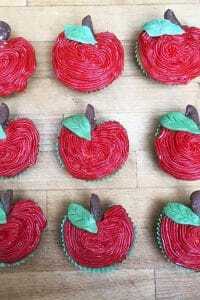 Assemble the cupcakes by using a piping bag and nozzle decorate the apple shaped cupcakes. 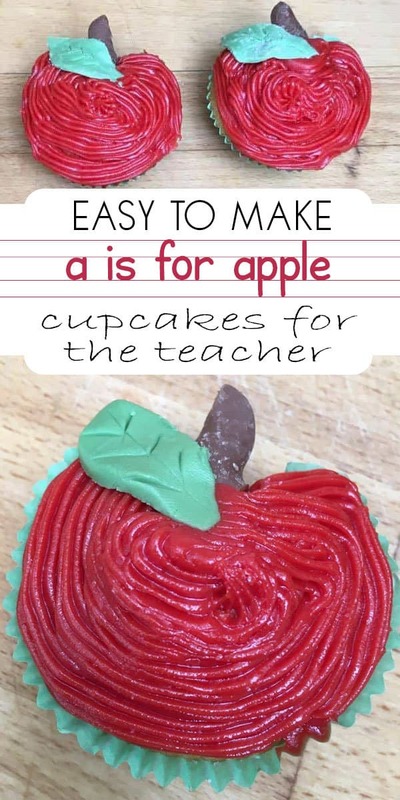 Add a leaf per cupcake near the indent at the top. Complete with a chocolate finger stalk and let the frosting set. Recipe for the Simple Cupcakes. Recipe for the Vanilla Buttercream Frosting. I’ve tried and tested a number of different baking tin since leaving home at 18 and I’ve found that the best muffin tins that last, don’t rust and I can use for cupcakes, muffins and even Yorkshire puddings are these Non-Stick Muffin Pans from Wilton. I have a couple because I seem to always make more than 12 at a time. I find it much easier to decorate cupcakes with a piping bag and nozzle and as I’m not keen on single-use plastics I love using a silicone bag and nozzles which can be washed and reused time and time again. Unlike the old fabric one that my mum used it doesn’t get all over your hand and is much easier to wash as well. Quick and easy is the name of the day especially for busy mums and although I am quite handy with a knife and creative I don’t have time to sit and cut out shapes for decorating cakes. So instead I have a set of this push and cut fondant shapes. I love how easy they are to use and it includes different sizes of some of the popular items like the leaves we used on these cupcakes and the butterflies on my daughters 3rd birthday cupcakes.